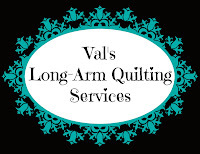 Val's Quilting Studio : It's Going to be a Great Year! for a variety of reasons, I couldn't feel more happy and full of joyful anticipation for the year ahead. Yes, we have school during the Solar Eclipse and we are in a 100% zone! Kinda exciting! And a variety of others sections. Some that I've"customized" to fit my "quilty" needs. This page below shows my monthly projects at a glance. My husband was very humored as I played with washi tape and all the coordinating stickers that came with the book to put this all together exactly how I wanted it organized. But seriously, with it's resusable sheet protectors and additional folder, I'm able to keep all my "stuff" in one 8 1/2" x 11" book. I've eliminated two desk calendars, a lesson plan book and with the addition of their "monthly bills" tracker insert... my budget book! (Yes, I'm NOT a computer/techy person) I'm also looking forward to resurrecting my ol' "scrapbooking" skills and including pictures each month as pictured on the monthly page above. Our classroom quilt made by last year's class made it's school debut at our Back to School BBQ this week. The kids were thrilled with all it's ribbons earned: A First Place Blue Ribbon in the Youth Group Category. A BIG Purple "Fair Board's Choice Award" annnddd and an orange "Viewers Choice" ribbon! Need-less to say, a popsicle party is in their near future! I had planned to use the quilt in our classroom, but many staff members and parents have asked if I'm going to "raffle" the quilt. I honestly, haven't given this much thought. So we'll see. Anyhoo, I'm just very grateful right now to be at a place in my life's journey that finds me genuinely content. My past few years have been filled with some of life's trials and tribulations that I sometimes worried I wouldn't be able to get through. But as those years have passed and acceptance has evolved, time has begun to heal my heart and without a doubt, the fact I'm not alone in these challenges has made all the difference in my healing. I have to say though, it's honestly just soooo nice to have settled into a new normal that finds me stronger and wiser and ready to shine once again! My new class enjoyed being greeted with glow sticks as they arrived for Back to School night. It's going to be a great school year! Please stay tuned. WIN quilt batting this summer. Click HERE to read how. I'm the child of two teachers and they observed that some years are better, easier, more fun than others even if you give the same effort and enthusiasm all the time. Glad to read you're ready to embrace a new year (hopefully with fewer snow days!) and I hope you and all your colleagues and students have a great year. It looks like you are off to a great start. It's not an easy job. Congratulations on all the quilt ribbons. That's wonderful. Good luck with your new school year. So nice to see the multiple ribbons for the class quilt. The kids (and you) must be so proud. Hope the eclipse event goes without a glitch. Exciting! I tried to go digital with my schedule but I am a paper and pencil person. Your calendar looks so happy! I so love your attitude and know the kids do to. The quilt is fantastic and love how you shared those sewing skills last year. Teach on! Val, I'm so happy for you...that you are in such a wonderful place in life. It shows in your blogging and is inspiring. May we all find that one day. Congratulations again on the awards for your quilt. I bet a raffle would raise a lot of money. Good luck with this school year. Organization is a wonderful feeling! How nic to have everything combined into one. Congrats on all the ribbons! Welcome back to the classroom, Miss Val! You are going to have a fabulous year with your class, I just know it. Those kids are surely blessed to have you as their guide and mentor. I think you should have a blue ribbon for the best teacher award! Congratulations to you and your students on a truly award winning quilt! I wish you a Happy New School year and hope you and your students enjoy the joyful journey that you will be taken on as you share all that is to be learned this year. Love Love Love the quilt. I think it would be hard to let it go if you raffled it off. Tuesday Archives #168 : WORDY Projects! Jackson: Pet on Quilts Show!